​By Gloria Garland L.Ac, Dipl. Ac. & CH. This little red, raisin-like berry has long been considered a longevity and anti-aging herb in China. Gou qi zi, (Fructus lycii) pronounced: go-chee-za, is traditionally noted for keeping the legs and body strong, the vision bright and promoting a cheery outlook. Modern research not only supports these ancient claims but ads new credits to this tiny berry’s extensive resume, including immunity enhancing and anti-cancer and blood glucose regulating properties. 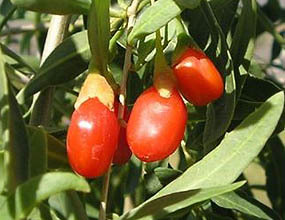 Gou qi zi (also known as Goji) contains extremely high levels of antioxidants. Tiny Gou qi zi is quite possibly the highest antioxidant food on earth. Antioxidants are nutrients that combat omnipresent free radicals, which are created through oxidation in the body. Free radicals are highly reactive, unbalanced molecules, which are the byproducts of regular metabolism and are associated with the degenerative aging process and many diseases. Free radicals act by stealing electrons from healthy cells to neutralize their own charge, resulting in cellular damage. Free radicals are also created by every day exposure to things like environmental pollutants, cigarette smoke, smog and other harmful chemicals, toxins, and even sunlight. The current feeling among medical researchers is that antioxidant supplementation counters the effects of free radicals. Beta-carotene - an antioxidant nutrient that is converted to vitamin A. Horses utilize vitamin A for bone and muscle growth, reproduction, and to regenerate skin. It is also critical for vision epically night vision. Vitamin E - another antioxidant thatprotects the body’s tissues from free radicals created during exercise. Muscle and other tissues consume vitamin E during increased physical activity, making vitamin E beneficial for protection against exercise-induced free radical damage and reducing muscle inflammation and soreness. Vitamin C is essential for creating and maintaining bone and cartilage tissue. Vitamin B1 and B2 - enables metabolization of carbohydrates, which allows the horse to process energy from feed. They are also critical to the function of the nervous system. Vitamin B6 is critical to the formation of red blood cells; the body also uses Vitamin B6 to create the hormone epinephrine (adrenaline). Amino acids - Amino acids form proteins, which are the building blocks of the body and are the bases for every cell and tissue. Gou Qi Zi contains 18 kinds of amino acids, eight of which are essential. Trace minerals - are chemical elements that are needed in minute quantities for the proper growth and development. Gou qi zi contains twenty-one trace minerals, including zinc, iron and copper. Gou qui zi, is widely cultivated in China and is grown in the United States. It is common in Asian food markets. Gou qui zi is sweet and tasty and makes a wonderful trail snack mixed with almonds or walnuts. It is a great snack for both horses and owners alike. Good quality berries are plump and oval shaped. Avoid dark-tipped or powdery looking berries. Only a small serving of Gou qi zi is necessary. I recommend 1/3 cup for horses and ¼ cup (a small handful) for humans daily. Gou qi zi is not recommended during fevers or diarrhea or for individuals with high insulin sensitivity.